The total value of all final goods and services produced within a nation in a particular year, plus income earned by its citizens (including income of those located abroad), minus income of non-residents located in that country. (GNP) is a broad measure of a nation’s total economic activity. 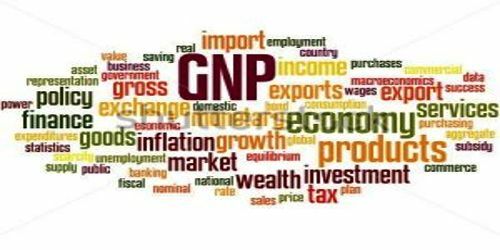 GNP is the value of all finished goods and services produced in a country in one year by its nationals. GNP is one measure of the economic condition of a country, under the assumption that a higher GNP leads to a higher quality of living. GNP is commonly calculated by taking the sum of personal consumption expenditures, private domestic investment, government expenditure, net exports, and any income earned by residents from overseas investments, minus income earned within the domestic economy by foreign residents. Net exports represent the difference between what a country exports minus any imports of goods and services. The goal of GNP is to not only capture the value of the economy within a country’s borders, which GDP calculates, but to adjust that for the value of a country’s citizens. So while GDP generates a value based on where income is generates, GNP generates a value based on the ownership of that income. An example of an income inflow when calculating the GNP for the U.S. would be an American company that owns a subsidiary in Canada. During the year if that company sends $100m in dividends back to the parent company in the U.S. that would directly increase GNP by $100m. Using a GDP measure that $100m would still count towards Canada’s economic value. An example of an income outflow could be foreign workers in the U.S. that send part of their paychecks to family based in their home country every month. At the end of the year any amounts they have sent home would be deducted from the U.S. GNP calculation and included in that of their home country. GNP per capita is a measurement of GNP divided by the number of people in the country. This makes it possible to compare the GNP of countries with different population sizes.